When working with semi-tubular rivets, it's not uncommon to experience problems. Learning to troubleshoot those problems can help to save a tremendous amount of time, cost, and frustration in any manufacturing environment. One of the problems that can create issues when working with semi-tubular rivets relates to shank length and what is known as clinch allowance. Shank length is determined based on a combination of stack up and clinch allowance, or the required rivet stick out. Generally, clinch allowance falls somewhere between 50 percent and 65 percent of the diameter of the rivet shank. When there is too little rivet stick out, the result is an insufficient amount of rivet material in order to clinch the parts together. On the other hand, if there is too much stick out, the clinch may not be able to clamp the parts together tightly enough for the required application. Problems can also arise with the rivet end-hole diameter. Semi-tubular rivets feature a hole at one end. The wall of the semi-tube curls over in order to form the clinch. 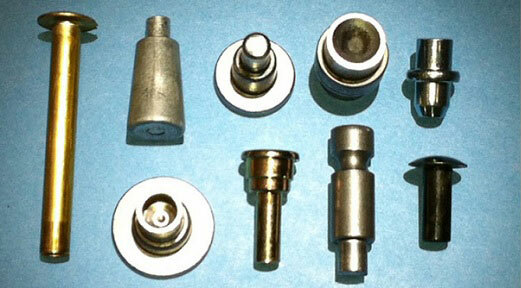 Generally speaking, the rivet hold diameter ranges between 70 percent and 80 percent of the rivet diameter. The larger the percentage, the thinner the wall of the tube will be. While thinner tubular walls do offer easier formation, holding strength may also be lacking with thin tubular walls. It's also important to realize that proper hole depth is critical to prevent the roll-set plunger from coming into contact with the body of the rivet. If that should happen, the rivet shank could swell or become otherwise deformed. In a semi-tubular rivet, the average hole depth should be between 100 percent and 125 percent of the rivet hole diameter. Working with inferior-quality semi-tubular rivets can also present problems. The best way to prevent such problems from occurring is by ensuring that you are working with the highest-quality rivet possible. At Universal Rivet, we produce only high-quality rivets designed to provide the greatest longevity and hold up to even in the most stringent production environments.